Global Economy Matters: That Which The ECB Hath Separated, Let No Man Join Together Again! That Which The ECB Hath Separated, Let No Man Join Together Again! In a recent post on the FT Money Supply Blog the ever perceptive Ralph Atkins made the following, very interesting, observation which, I think, goes a long way towards helping us all understand what exactly the thinking is which lies behind the ECB's current strategy for its handling of the Eurozone economy. One of the subtleties of yesterday’s complex package from the European Central Bank was that it attempted to re-assert the principle of “separation”. 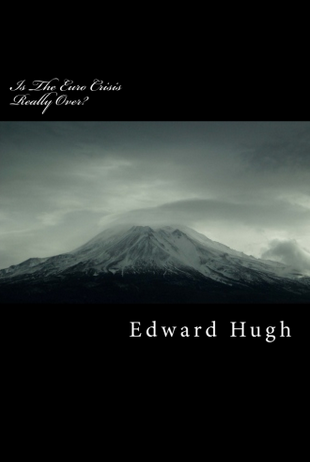 When the financial storm broke in August 2007, the ECB insisted, doggedly, that emergency financial market liquidity injections were not related to its monetary policy. That remained firmly aimed at controlling inflation and still very much determined the level at which it set the main policy interest rate. Indeed, in July last year the ECB famously raised the interest rate to 4.25 per cent because inflation appeared to be getting out of control. The separation that is being talked about here is not then a matrimonial one, nor is it a Montesquieu type notion of a necessary and sufficient separation of powers between Brussels and Frankfurt, rather what is involved is a separation, which is customarily made by the ECB, between monetary policy and liquidity provision. Now all of this may seem rather obscure, and it is, but it is also, I will argue here, rather central to understanding what the ECB is up to, or trying hard to be up to, at the present moment in time, and why what it seems to be giving with one hand it also seems to be taking away with the other. For over a month now the ECB has been busily trying to lay down, before an ever observant corps of financial journalists, the main lines of its exit strategy from the emergency liquidity provisions introduced in the midst of the financial crisis. The first significant decision was the raising of the collateral standards for asset backed securities - from March 1 2010 the bank “will require at least two ratings from an accepted external credit assessment institution for all” asset- backed securities submitted as collateral, according to the press release of 20 November. It is important to note that, at this point in time, the ruling only applies to asset backed securities, and the ECB has yet to formally confirm that the temporary relaxation of the collateral criteria as applied to government bonds for the duration of the financial crisis will be withdrawn as planned at the end of 2010. This, of course, has become far more than an academic question following this weeks decision by Fitch Ratings to cut the ranking of Greek sovereign debt to BBB+. What this means, effectively, is that should the two other major ratings follow suit (a not improbable scenario) then the ECB will no longer be able to accept Greek bonds as collateral, since while the ECB is currently accepting bonds with a minimum BBB- rating, this gesture is surely going to be phased out as the enhanced liquidity support is withdrawn . As things stand, as of 2011 at least one A- will be the minimum level required. More significantly for many perhaps, this month’s ECB meeting also saw the ECB move to scale back its emergency lending to the banking sector in a way that clears the path for a move back to variable rate tenders later in the year and leaves policy makers free to raise rates as needed. The bank announced that this months 12-month tender would be the last and indicated that the 6-month tenders would also be axed after 31 March. The 12-month tender would also be offered at what amounts to a floating rate that would be indexed to future changes in the ECB’s main refinancing rate in a way which means it is impossible to discern in advance any particular intention about the level of the main refinancing rate. At the same time they indicated that the weekly, 1 month and 3 month financing tenders would remain in place on a fixed interest rate full allotment basis for as long as necessary, and at least until April 13, which means that while enhanced bank financing is being slowly phased out, it is still in place, and there is no definitive date yet for the complete termination of the programme. Basically this all seems fairly logical, and yet, as Ralph Atkins asks, one obvious question remains, which is why the it should be the case that the ECB is so intent on implementing its “exit strategy” when, surely, given the seriousness of the problems which are still to be resolved in some key Eurozone economies, one might have thought they should continue to implement some sort of ultra-loose monetary policy just like their counterparts in the Bank of Japan, the US Federal Reserve, or the Bank of England? Well, part of the key to unravelling the apparent dilemma the recent move presents is possibly to be found in a response ECB President Jean-Claude Trichet gave in answer to questions put to him by journalists after the last meeting. “We are not" he was at pains to say "signalling anything in terms of a hardening of our monetary policy - absolutely nothing,” So here we have it, as Frank Atkins suggests, the ECB is applying a straight principle of separation between monetary policy and liquidity provision (although I doubt that many financial journalists are quite as perceptive as Frank Atkins evidently is). Monetary policy remains as loose as it ever was, with the key refinancing rate staying firmly at the 1% level (hardly suprising in the context of the fragility of most Eurozone economies) while the enhanced liquidity provision is being systematically withdrawn. Now why should this be? Well, one of the principal problems the ECB currently faces is the use which is being made of all that ever so generous enhanced liquidity ECB funding by Greek banks. According to analysts at Goldman Sachs Greek banks have been making very extensive use of the ECB liquidity provision. They estimate that at the end of the third quarter of this year, the four major Greek banks (Alpha, Eurobank, National Bank of Greece, and Piraeus) had availed themselves of some €28.3 billion in liquidity provision, down admittedly from the €42.3 billion they were soaking up at the end of the second quarter, but still way over the percentage of Greek participation in ECB capital. And even this reduction comes, it should be remembered, aftered the Central Bank of Greece directed local lenders to scale back their reliance on cheap funding from the European Central Bank. Yet, as Goldman Sachs point out, such extensive use of the ECB exceptional liquidity provision might seem rather counterintuitive given that the loan to deposit ratio within the Greek banking system is pretty low (between 98% and 122% for the four major banks) and the liquidity position of the banks thus appears very sound. So why the hell do they need so much money you may ask? Secondly, the current spreads on Greek government bonds (around 200 base points over German 10 year equivalents) offer Greek banks an exceptional arbitrage opportunity, since by taking advantage of the uniform ECB liquidity rate Greek banks can buy higher Greek government bonds with a much higher yield than the government bonds which their French or German counterparts buy. Regardless of the risk implied through by the Greek CDS spread, Greek government bonds carry a zero risk weighting when calculating riskweighted assets for capital purposes. So for Greek banks this arbitrage carries no capital impact whatsoever. That is to say the Greek banks have been doing very nicely indeed out of the Greek sovereign embarassment, than you very much. Hence it is not difficult to understand the ECB's growing sense of outrage with the situation. On top of this we need to add the growing frustration of the ECB and EU Commission on finding that the Greek government not only had not taken advantage of these liquidity advantages to introduce effective policy action to stop the deterioration of Greek government finances, but in fact had gone in precisely the opposite direction, greatly exceeding in spending decisions all their earlier promises and guarantess. Finance Minister Papaconstantinou's final 2010 budget plan, as presented to parliament on November 20, made plain that the financial situation is much worse than anticpated, and that the government now aims to reduce the fiscal deficit from 12.7% of GDP this year to 9.1% of GDP next year. In the earlier draft, as made available to the EU Commission when it determined that Greece had taken insufficient action in 2009, the objective was 9.4% of GDP for this year. The Commission calculates that under unchanged policies, the Greek deficit would be 12.2% of GDP in 2010 with government debt at around 120.8% of GDP, up from 113.4% this year. 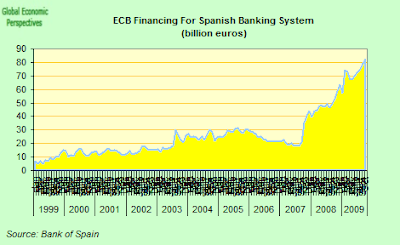 According to Bank of Spain data, Spanish banks were receiving approximately 82 billion euros in longer term financing from the ECB as of last September. And, as in Greece, a large chunk of this money has been being immediately recycled to finance a ballooning government deficit, one which, as in Greece, is expected to hit 12% of GDP this year. 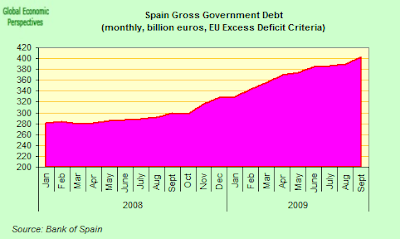 So the ECB has been providing, indirectly, funding to Spain's government in a bid to help Spain try to withstand the hefty economic crisis it is faced with, and this government spending (along with the significant drop in interest and loan payments produced by the 1% interest rate which impacts Spanish loans and mortgages) has given strong support to Spanish domestic demand. But after years of structural distortion, Spain's manufacturing sector is, let us remember, massively uncompetitive. 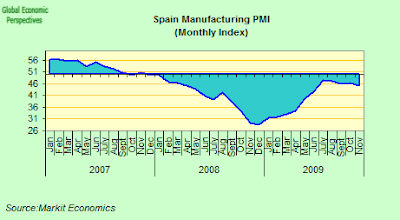 In fact, Spain's manufacturing sector was contracting in November at the fastest rate in any of the 26 countries included in the JP Morgan Global Manufacturing PMI survey. And where, then,could we imagine that all this money which is being used to prop up demand has gone? Well, we could imagine couldn't we. On buying imports, that's where a big chunk of it has gone, even as Spain's unemployment queues grow longer and longer. After falling for several months, September's goods trade deficit was up again, and has in fact it has been rising since last August. 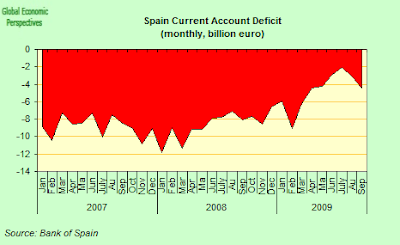 So let's spell this out again - Spanish banks wer receiving a total of 82.5 billion euros in liquidity funding via your open market operations in September, up from 49.1 billion euros in September 2008, and this money, far from having a positive impact, has been going to sustain the unsustainable. 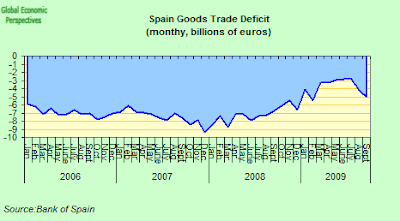 At the same time, Banco de España data show that over the same time period Spanish bank funding of government borrowing rose from around 300 billion euros to around 400 billion euros, while the monthly goods trade deficit increased from 2 billion euros to 5 billion euros between July and September 2009, and the September current account deficit bounced back to a rate of roughly 4.5% of GDP from the July low of around 2% (see chart below). So where, we might ask oursleves is the "correction" here? This kind of monetary and fiscal support on the part of the ECB is entirely justified and understandable, if it is really to give a cushion to countries like Spain and Greece to make a painful transition. But if the money is simply used to sustain the unsustainable, and even is used to make the situation worse, then what really is the ECB supposed to do? It must be worrying ECB decision makers like hell that the enhanced liquidity provision which is being facilitated from the ECB is, in the context of the very low level of international competitiveness of a good part of Spanish industry and services following the distortions produced by the property bubble, having the rather perverse and completely unintended consequence of funding a rise in Spanish imports (thus putting ever more Spaniards in the domestic sector out of work) via the demand injection which is being administered by the Spanish government? Monsieur Trichet, there are countries in the Eurozone that are starting to recover and some others, like Spain, in which the absence of reforms will condemn them to remain in recession for the coming months. 1.- Are you worried by such apparent diversity within the Eurozone? 2.- In your opinion, what practical implications such divergence will have for the conduct of monetary policy at the ECB? Under a "European divergence" scenario, it could happen that the "Optimum Currency Area" assumptions wouldn´t be valid anymore, and that an "average" monetary policy would start being harmful instead. 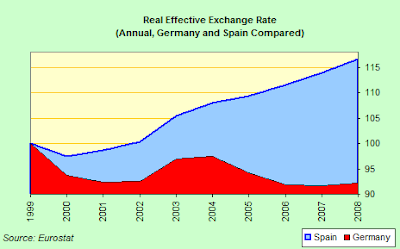 For example, if some European countries (like Germany or France) start having positive inflation rates, while others (like Spain, Greece, Portugal or Ireland) continue in deflation, implementing an "average" monetary policy could be harmful: especially if the monetary policy, due to the high weight of the French and German economies, leads to the "average" monetary policy becoming slightly restrictive. This would lead to further rounds of deflation in the "deflationary" countries. 3.- Has the ECB a plan to cope specifically with this issue? Or will the ECB continue with the "average" monetary policy it has exercised until now? Monsieur Trichet was not amused. 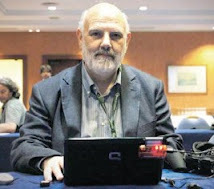 In a strongly worded reply that was given extensive coverage in the Spanish press (but barely received a mention in the English language one), he told Ramon Tremosa in no uncertain terms that there would be no second chance for the banks, "There is not one Euro for Spain, and another for the other countries. There is only one Euro, one rate of interest, and one exchange rate". So, the carving knives are now out. The ECB has been put in an impossible position, and intends to act as it sees fit. The lions share of the responsibility now rests on the shoulders of Europe's political leaders. Only this afternoon Angela Merkel came to the temporary rescue of an increasingly besieged Greece, by pointing out that healthier members of the euro zone aren't prepared to abandon Greece and other heavily indebted countries in the currency union. Worthy remarks, and absolutely to the point. But how far is it the responsibility of richer and economically healthy states to continually come to the rescue of those who insist on doing nothing to improve their own situation? 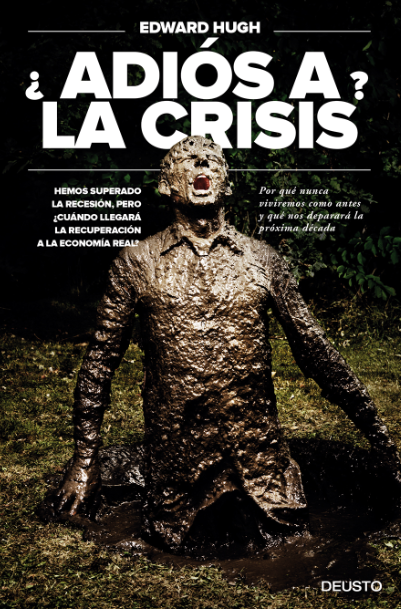 On precisely the same day Spanish Prime Minister Jose Luis Rodriguez Zapatero came out fighting, and rejected all rejected negative economic forecasts that currently surround Spain, saying for the umpteenth time that Spain was about to emerge from recession. How much more in denial is it possible to be, and how much longer must the future of all Europeans continue to be put at risk by head in the sand statements like this?